Making a gluten-free angel food cake is easy and can be done without sacrificing the light texture typical of this cake type. Using a gluten-free flour mix instead of standard all purpose flour eliminates the gluten, while xanthan gum helps to bind the flour. Use any commercial or homemade gluten-free flour blend mixture. When preparing for the recipe, do not grease the pan you use for your gluten-free angel food cake. Like all other angel food cake recipes, if the sides are oiled, the cake will have nothing to stick to, and the cake will not rise. The use of an angel food cake pan with a removable bottom and inner tube will facilitate the removal of the product after it's baked. Preheat oven to 325 degrees. Gather an angel food cake pan, but do not oil or grease the pan sides or bottom. Sift the gluten-free flour blend mixture, xanthan gum powder, and 3/4 cup of granulated sugar together. Reserve for later. In a mixing bowl, beat the egg whites until light and foamy. Add in the pinch of salt and the cream of tartar. Continue beating until soft peaks have formed. Add the remaining 3/4 cup of sugar about two tablespoons at a time, and continue to beat until stiff peaks have formed and the whites are glossy. Transfer the stiff egg whites to a large mixing bowl, and fold in about a quarter of the sifted dry mixture until combined. Continue to incorporate the dry ingredients, a quarter at a time. When all the flour mixture is combined, fold in the vanilla extract. Spoon the egg white mixture into the angel food cake pan. To ensure no large air pockets are inside the cake itself, gently run a metal spatula through the center of the mix all the way around, then smooth the top to make it even. Bake in the preheated oven for about 50 to 60 minutes, until the cake is golden brown. Remove from the oven and turn upside down. Cool for about 15 minutes. Turn right side up, and run a butter knife around the edge and the inner tube of the pan. Invert, or lift up on the removable pan center and remove the cake from the pan. 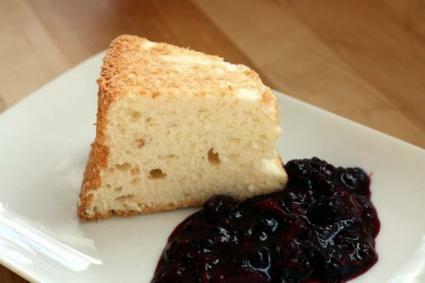 A gluten-free angel food cake can be made ahead of time. Simply wrap the cake after it has completely cooled in plastic wrap, and sliced when needed. Decorate if desired.